Today, Texas is ground zero in the fight against extremist anti-immigrant and anti-Latino hate. The Lone Star state led the attack to successfully push the Trump administration to rescind DACA, enacted the most extreme anti-immigrant and anti-Latino laws in the country (SB4), and has expanded the reach of ICE-sheriff entanglement not before seen in any other state. 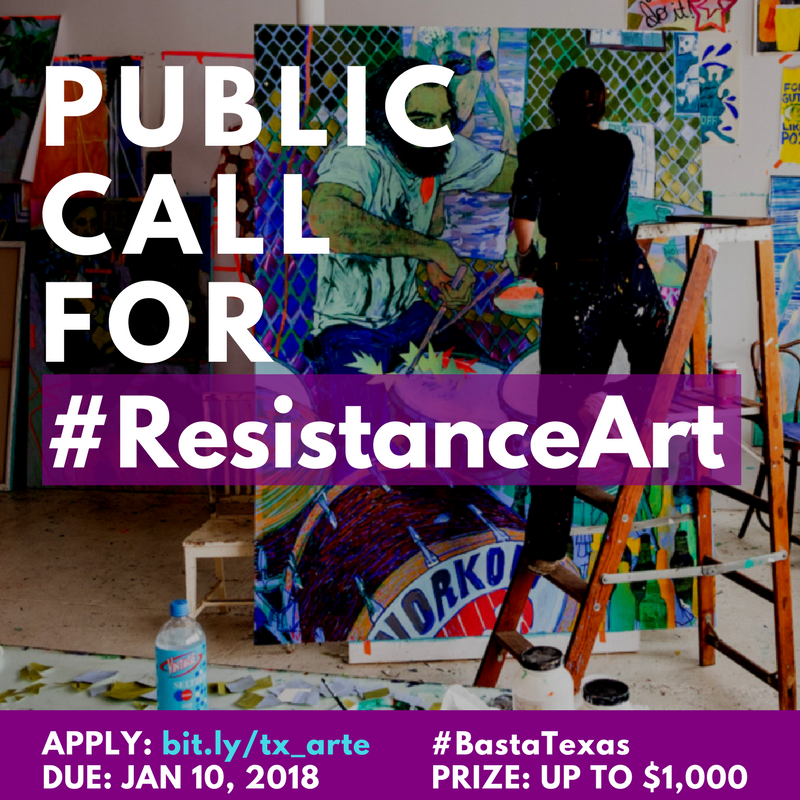 That is why the Basta Texas campaign is calling on artists from Texas and across the country to resist hate through the power of art and culture with two contests and grant opportunities. Basta Texas is a joint project of the National Day Labor Organizing Network(NDLON) and Jolt. For more information click here. Basta Texas is seeking proposals for creative acts of resistance that tell the real story of immigrant and Latinx communities in our state. If you have a creative idea that uses the power of art (music, dance, visual imagery, etc.) that can tell our story and uplift our communities, submit a proposal today. We are looking for proposals that inspire, uplift and celebrate our communities’ resilience. A committee of Texas-based artists will help select 10 projects to receive funding ranging from $500 to $1,500. NDLON and Jolt will work with grant winners to execute projects and ensure broad media coverage. Applications are due January 10, 2018. The Basta Texas campaign is launching a poster creation campaign based on the successful effort that NDLON led against Arizona’s SB1070, which helped create 120 unique images to help lift up the grassroots fight and story of SB1070. We are calling on visual artists to submit posters on issues affecting immigrants, from fighting back against SB4 to defending DACA and TPS. Artists will have the chance to win a $1,000 cash prize, copies of their poster printed and shared with social justice organizations across the country, and a profile piece of the artist in a national news publication. Submit your art by January 10, 2018. Every generation has counted on songs that inspire action and courage in the face of injustice. Basta Texas is launching a Sounds of Resistance song contest, calling on musicians of all styles to submit a song that celebrates our communities, the courage of immigrant families, and the power of local struggles. Because nothing breaks through the walls of fear and hate, like a powerful song, this moment calls for new songs to accompany and inspire our movement today. A panel of musicians and producers will select one song as the winner to receive a $1,000 cash prize. The winning song will be shared across the country through NDLON, Jolt, and Texas Basta Texas social media platforms. In addition, NDLON will work with the artist/s to produce a music video to share the song. Submissions are due January 10, 2018.